A line of oil mist eliminators that fit onto the exhaust of a vacuum pump to create a cleaner and safer environment in small production and assembly areas is available from MV Products of North Billerica, Massachusetts. MV Oil Mist Eliminators help prevent the “smoke” produced by vacuum pump exhaust streams from escaping into the work environment and being inhaled by workers and settling on furniture, walls, and equipment. Featuring one micron replaceable fiberglass coalescing filter elements, these vacuum pump exhaust filters come in several housing sizes and yield 99.9999% efficiency. 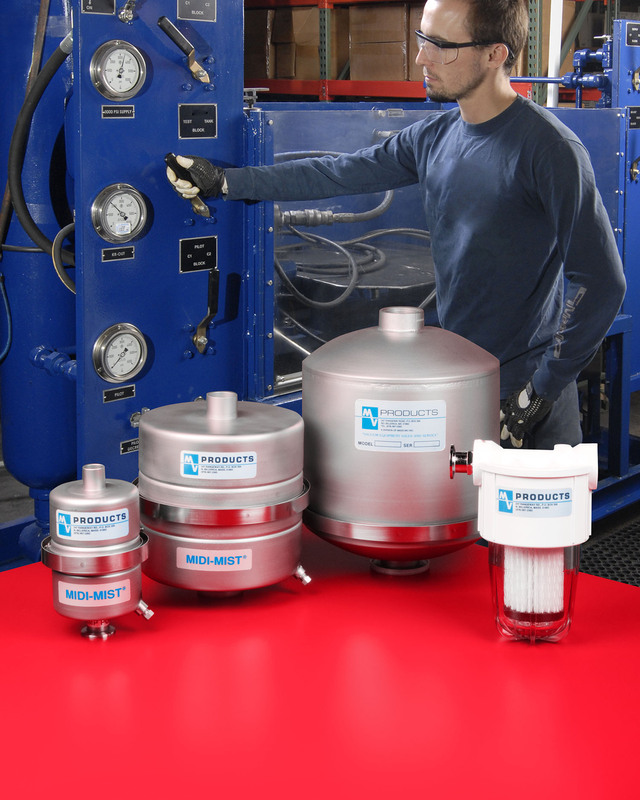 Available to fit vacuum pumps from 5 to 300 CFM, MV Oil Mist Eliminators can be configured to recover or recirculate costly pump fluids. The line includes the VisiMist® (clear polycarbonate sump) and the stainless steel Midi-Mist® 4” dia. that uses one filter, the Midi-Mist® 8” which has three filters, and Maxi-Mist® 10 which has five. MV Oil Mist Eliminators are priced from $75.00 to $1,520.00 (list), depending upon size. Literature and pricing are available upon request.